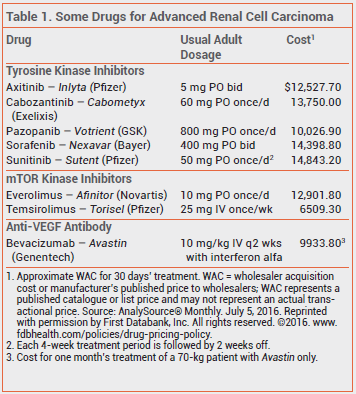 In Brief: Cabozantinib (Cabometyx) for Advanced Renal Cell Carcinoma (online only) | The Medical Letter, Inc. The FDA has approved the oral tyrosine kinase inhibitor cabozantinib (Cabometyx – Exelixis) for treatment of patients with advanced renal cell carcinoma previously treated with antiangiogenic therapy. Cabozantinib was first approved in 2012 as Cometriq for treatment of progressive, metastatic medullary thyroid cancer. Common adverse effects of cabozantinib include diarrhea, fatigue, nausea, vomiting, weight loss, palmar-plantar erythrodysesthesia, and hypertension. Serious adverse effects, including GI perforation, hemorrhage, and arterial thromboembolic events, occurred in >60% of patients treated with cabozantinib in the clinical trial. The recommended dosage of cabozantinib is 60 mg taken once daily without food. Dosage adjustments are required for patients taking strong CYP3A4 inhibitors or inducers concomitantly.4 In patients who experience severe or intolerable adverse effects, reducing the dosage or withholding the drug until improvement occurs is recommended. Axitinib (Inlyta) for advanced renal cell carcinoma. Med Lett Drugs Ther 2012; 54:47. TK Choueiri et al. Cabozantinib versus everolimus in advanced renal-cell carcinoma. N Engl J Med 2015; 373:1814. TK Choueiri et al. Cabozantinib versus everolimus in advanced renal cell carcinoma (METEOR): final results from a randomised, open-label, phase 3 trial. Lancet Oncol 2016 June 3 (epub).